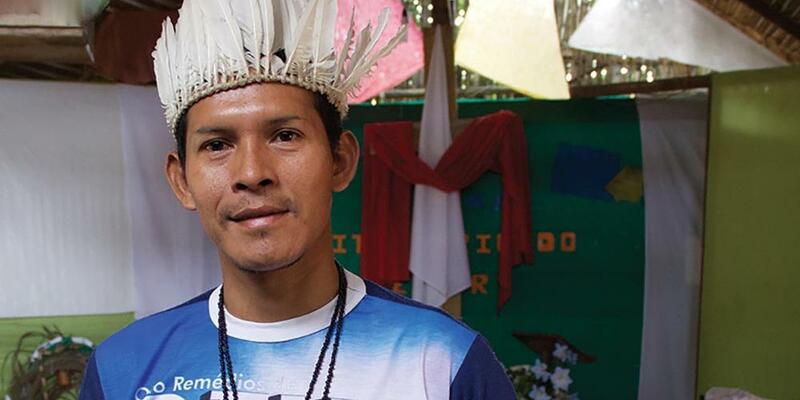 Waciri grew up listening to stories from his grandmother about Leo and Jessie Halliwell, the Luzeiro missionaries who brought health and hope to the people of the Amazon jungle. His grandmother told how her father, the tribal chief, made the first contact with Leo Halliwell. At the time, they could only communicate using signs, because the tribal people did not speak Portuguese. But he understood that the Halliwells had come to help the people, and welcomed them into his tribe. One item of special interest to the villagers was a hand-cranked gramophone. When the Halliwells first entered a village, they set up their gramophone and played recordings of Christian hymns. The people loved the music, and word about this special machine spread quickly along the river villages. Sometimes the Halliwells traveled to unentered villages without their friend, the tribal chief. On one such occasion, the Luzeiro was headed into a very dangerous community, known as the “head cutters”—a tribe known for its cruelty. As the Luzeiro was approaching the village, a young man who was helping the Halliwells on the boat caught sight of some of the tribesmen along the shore. The men were pointing at the Luzeiro, and then pointing to the side of their heads. They repeated this gesture, and the young man was certain they were preparing to cut off their heads. “No,” said Leo Halliwell, knowing that they needed to enter this village too. “Be calm,” he told the young man as the Luzeiro pulled up to the shore. Stepping off the boat, Leo Halliwell greeted the tribesmen, who kept pointing to the side of their heads. Suddenly, he realized that they were pointing specifically to their ears—they wanted to hear the gramophone! Quickly he set up the gramophone. As the hymns began playing, the tribes people gathered around, with smiles spreading across their faces. The way was opened to reach even this feared tribe with the Adventist message of hope and healing. Leo Halliwell was careful to keep in touch with his friend, the tribal chief. Little by little he taught him distinctive Biblical teachings, such as how to keep the Sabbath, and about clean and unclean meat. Since Waciri’s great-grandfather was the tribal chief, he introduced the concept of clean and unclean meat to the community. It caused a great division, and some people left. The tribe became smaller, but the remaining group continued to practice this rule in their eating habits and it carried to the second and third generation. Several years ago, the tribe had to leave their jungle village and move to a set apart area on the outskirts of the city of Manaus. Not everyone in the tribe believed in God, and many of them drank alcohol. This led to a lot of fighting within the community. When Waciri became chief, he banned the use of alcohol within the tribe. Next, he invited everyone in his tribe to keep the Sabbath—currently, half of the tribe members are Sabbathkeepers. Waciri longed however, for his people to have a proper place to worship Tupan, (the word for God in his local language). One night, Waciri had a dream. In his dream he saw a beautiful “House of Tupan,” complete with roof, floor, and walls. When he awoke, Waciri immediately sketched what he had seen in his dream. But he had to wait 12 years for his dream to become a reality. Then one day, the dream started to become real. A load of wood was sent as a gift to the tribe—it was enough to build a roof. Then more material was given—bricks, chairs, a pulpit. Suddenly it all came together and the church was built.